Dr. Ilana’s clients can be sure of one thing: she loves ALL of her patients. But she does have a special place in her heart for dachshunds. There’s just something about their wriggly earnestness, the hope and determination that lights up their eyes…she simply cannot resist them! 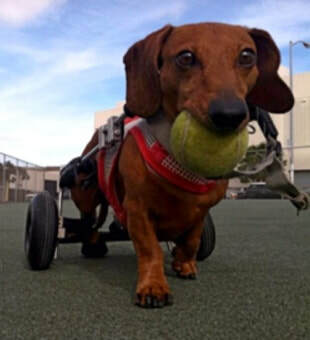 Through the efforts of an amazing rescue organization, Rocket Dog, she learned about Jack, a paralyzed dachshund who’d been turned in to a local shelter, she knew she had to step in! Jack’s previous guardians were unable to face the cost of surgery for his back and so surrendered him to euthanasia at the shelter. It was a sad end for a little man who still had so much to live for! Dr. Ilana pulled out all of the stops and found a foster mom who could save him. His new ‘mom’, Jean Goh, is a fabulous veterinarian who happens to work at the SF/SPCA and she knew exactly what to do. She treats him just like any other member of her family, raises the bar and expects him to meet the challenge. Which he does every time! Over the course of the last 4 years since he was rescued, he has responded to Jean’s loving care and is making a remarkable come-back. Jack’s begun to regain the use of his back legs, is increasingly mobile, and full of fun. Sure, he still uses his wheels to get around but, as you can see from our pictures and the video of him walking on the treadmill, he’s definitely on the mend! Some call him ‘The Come Back Kid’ and he’s proud of that! The other wonderful part of the story is that Jack’s foster mom wound up adopting him and he’s now a full-time member of her ‘pack’. Occasionally he goes to visit with his previous family, whose little boy adored Jack) and they all go out for a walk together. It’s a heartwarming end to what could have been a sad story and shows that with a little extra love, dedication, time, and patience, there is no reason to euthanize a ‘down’ dachshund! It’s a commonly observed effect of water-based therapy: patients will frequently start to ‘walk’ more readily in water than on land. This is because, where a patient’s body needs to re-learn the process of walking, we use a principle called ‘patterning’. In patterning, the buoyancy of the water supports the patient while we move their paws for them. This might look a little odd but basically we are ‘showing’ the muscles how to perform the movements we’re going to need them to do voluntarily on land. It’s like when you go to the physical therapist or chiropractor and they move your limb for you as they work to extend your range of motion. The muscles are not actually doing the work themselves but are being conditioned to be able to do it when the time comes. So, in Jack’s case, we’d settle him into the water and then help move his paws through a 10-cycle pattern of walking. Once he’d completed that phase of treatment, he was ready for the treadmill. As the treadmill moves slowly beneath his paws, he was encouraged to continue ‘walking’ in this way, and his muscles ‘learned’ what was expected of them. All the while, he is supported by the water and by us holding him securely too. You’ll notice in a video of Jack that his tail is grasped and you may be wondering why! It’s not that I am using it as a rudder to steer him (although that’s a pretty good guess!) but actually that stimulation of the tail is beneficial for dogs who have not started to regain use of their pelvic limbs. We call it ‘Spinal Walking’ and what happens is very interesting. Stimulation of the base of the tail causes stimulation of the central pattern generators in the spine and so the back legs start ‘walking’ all by themselves – no brain input required! You might be wondering how this is possible and here’s where it gets really interesting! As quadrupeds (4-footed animals) dogs are less dependent on their brain centers to walk. Instead of the signals coming from the brain, each leg is controlled by a locomotion generator on the spinal cord and that generator makes the leg move both independently and in concert with the other legs. Plus, dogs are able to form new connections to these generators within the spinal cord, even when they have suffered an injury to their back. So does all of this come only through working in a water environment? No, a lot of the treatment can be done on land too. In fact, Jack regained a lot of function in his back legs JUST from going on long walks in his wheelchair. He has an incredible drive to chase his ball and being on wheels was absolutely not going to stop him! Plus, over the course of time, the body has an incredible propensity to heal itself. For instance, nerve re-growth can be measured at the rate of approximately 2 mm per year! But the key to therapy using the underwater treadmill is Proprioceptive Neuromuscular Facilitation. Or in other words, for Jack, underwater treadmill exercise encouraged a more coordinated pattern of movement and a better use of his back legs: with the treadmill moving underneath his feet, his body was stimulated to take more coordinated steps and stronger connections were forged in the brain-to-foot pathways. In short, Jack’s brain was being re-trained to create a more coordinated “Walk” gait pattern.